The Germans know how to celebrate. With several thousand folk festivals throughout Germany, the nation invites up to 189 million visitors from all over the world every year. Whether in spring, summer, autumn or winter: every season brings at least one big event. Here we present the six biggest and most popular festivals. Not everyone is aware of the fact that the roots of every German folk festival surprisingly lie in the north of the country, more precisely in the port Bremen. As Germany’s oldest folk festival since 1035, Bremen’s Freimarkt originally was a pure commodity market with products from craftsmen and farmers. With the phrase “Ischa Freimaak”, the Bavarian equivalent of “O’zapft is”, Bremen’s Freimarkt quickly became a prototype for the expansion of other fairs. They first spread to the surroundings of Bremen and then to the rest of Germany. Today Bremen’s Freimarkt is a pure amusement event, with a costumed parade on the first Saturday of the 17-day event as one of its highlights. In addition, the Bremer Freimarkt ranks as the largest folk festival in the north. A little further north, the Hamburg Dom attracts several million visitors to the Hanseatic city of Hamburg. The event takes place three times a year. Next to the original winter Dom, taking place in the months of November and December, the spring and summer Dom were added after the end of World War II. With this implementation, also the not too cold-resistant visitors from the rest of Germany came. Directly next to the famous Reeperbahn, a landmark of the Hanseatic city, the countless bars and clubs invite the Dom visitors after a ride on the roller coaster, ferry wheel or the enjoyment of a Nordic fish specialty to let the evening end. Next to the original winter Dom, taking place in the months of November and December, the spring and summer Dom were added after the end of World War II. With this implementation, also the not too cold-resistant visitors from the rest of Germany came. Directly next to the famous Reeperbahn, a landmark of the Hanseatic city, the countless bars and clubs invite the Dom visitors after a ride on the roller coaster, ferry wheel or the enjoyment of a Nordic fish specialty to let the evening end. Christmas days are just over and most of the millions of inhabitants of Cologne are eagerly awaiting the long-awaited carnival season. Already on 11.11 at 11 o’clock 11 the beginning of the “jecken” time with one or two Kölsch (that’s a type of beerfrom Cologne) was toasted. With a small break around Christmas holidays the Cologne Carnival experiences its high point six weeks before Easter. From Thursday to Ash Wednesday the city is in a state of emergency. From funny animal costumes, up to disguises with reference to jobs or everyday objects, one marvels often at the creativity of the costumed. Often the sparse clothing in combination with usually low temperatures raises questions. With the famous “Nubbelverbrennung”, in which a straw doll is burned as a figure of the carnival scapegoat, the Cologne Carnival ends on Tuesday evening and heralds Lenten season from Ash Wednesday to Easter. 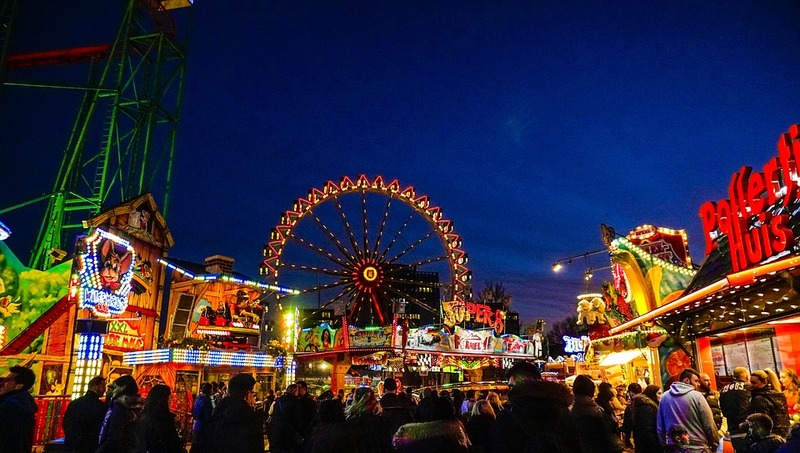 Directly beside the carnival metropolis Cologne its rival Duesseldorf once a year offers the “biggest fair on the Rhine” and NRW in the middle of the high summer month July. Around four million visitors come together every year at the Festwiese on the left bank of the Rhine in Düsseldorf’s Oberkassel district. Unlike most other folk festivals, the Rheinkirmes has a religious background and is celebrated because of those two occasions: the festival of St. Apollinaris of Ravenna, the patron saint of the city on the one hand and the church festival of St. Lambertus, the Catholic basilica on the other hand. Due to this religious reference a dispute of the name Rheinkirmes already took place several times. The catholic church pleaded for a renaming in Apollinaris-Kirmes. However, until today this was rejected with the reason that the designation as “largest fair on the Rhine” was already too firmly embodied with the majority of the population. With its 200th anniversary, the second largest folk festival in Europe established a record with 4 million visitors in 2018. 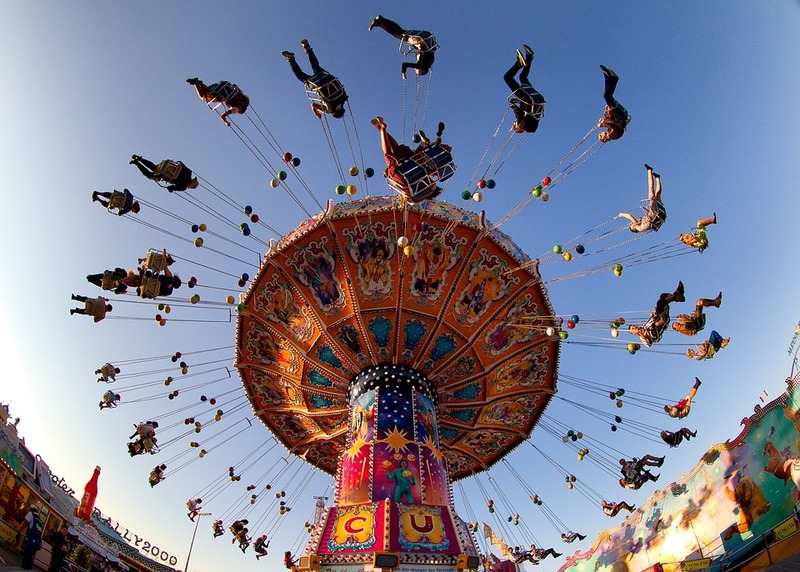 Twice a year, the Stuttgart Spring Festival and the Cannstatter Volksfest take place for 17 days in the district of Bad Cannstatt, directly on the banks of the river Neckar. Dressed in traditional costumes, such as Lederhose and Dirndl, you will find beer tents on the festival grounds. But that’s not all. According to the Baden tradition, the visitors can raise their glasses with regional quality wine in one of the several wine tents. Since 2007, the traditional festival has had a “Wasenhasi” mascot, a rabbit, which can be found hobbling around the grounds. The “Wasenhasi” has its origin in a traditional Swabian folk song. It is and remains the number one in Germany. Every year in September the Bavarian capital Munich is transformed into a home for the whole world with over 6 million visitors. The official opening of the Wiesn traditionally takes place in the Schottenhammel tent with the first beer barrel tapping by the mayor of Munich. Before that the Wiesn hosts, dressed in traditional costumes, move into the Theresienwiese on festively decorated horse-drawn carriages. Wearing Dirndl and Lederhosen the visitors will be toasting for two weeks on the wobbly beer benches, with a beer and a “Prosit”. Early in the morning of every Oktoberfest day, you are greeted on the Theresienwiese with long queues in front of the tent entrances. The later you arrive, the longer the waiting time and the risk of not being let into a tent. In order to enjoy a stress-free day at the Munich Oktoberfest, we recommend reserving a table in one of the festival tents in advance. The multitude and thematic variety of German folk festivals attracts many visitors from all over the world every year. Beside fun, good mood and getting to know nice people it can often be quite crowded at the events. Therefore, it makes sense to plan the folk festival visit carefully. In our blog we give further hints for the best time to visit the Oktoberfest or tips on how to save money at the Wiesn. This entry was posted in Oktoberfest, Uncategorized. Bookmark the permalink.